BROOKLYN — Every morning at school, 7-year-old Uriyah Sidof prays for extra recess. Literally, he prays for it — at Lamplighters Yeshivah, the Jewish Montessori school he attends in the heart of Hasidic Crown Heights, extra minutes of recess are doled out as a reward for especially heartfelt prayer. Recess provides Uriyah with a welcome break from the hard work of timed math tests, English language drills and science projects, subjects the majority of the 84,000 children who attend Jewish parochial schools in Brooklyn never get. Lamplighters is an exception — most Orthodox Jewish schools offer limited instruction in English, math and science, and some don't teach them at all despite being legally required to do so, DNAinfo.com New York has learned. Shmueli Lowenstein's experience is much more common. The 25-year-old is a former student at Oholei Torah, the most prominent yeshiva in Crown Heights, where, he said, “I did not grow up learning English or any kind of secular studies at all,” and subjects like phonics and math were “nonexistent." Under New York state and federal regulations, stories like Lowenstein’s shouldn’t be possible — all New York schools, public and private, are required to offer "equivalency of instruction" in basic general subjects such as American history and math. The state allows religious students to omit evolution questions on the Regents exam, but there is no waiver to exclude science from the curriculum. Oholei Torah would not answer questions about its curriculum. But more than a dozen parents, teachers and students told DNAinfo.com New York that many of Brooklyn’s Orthodox Jewish schools fall shy of even that narrow requirement, offering only an hour or two a day of pro-forma instruction for general subjects, if any. 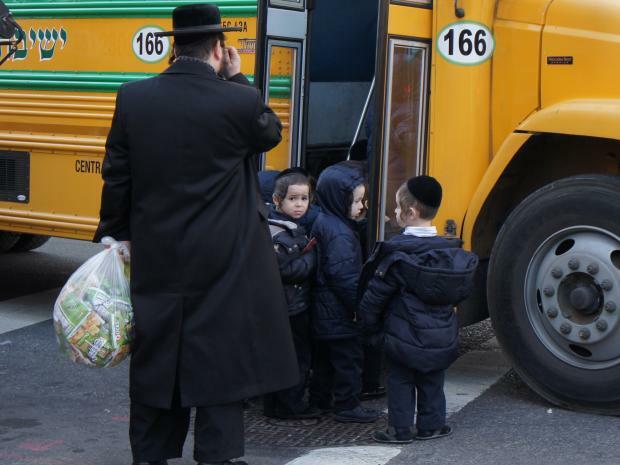 “There are a number of schools which have absolutely no pretenses of it — kids from 3-years-old to 18 have no secular education at all, ” said Zalman Alpert, a librarian at Yeshiva University and an expert on the Orthodox community. What the situation amounts to, Alpert and others say, is a school system bigger than Boston’s operating virtually without oversight, making it easily the largest unregulated school system in America. This week, DNAinfo.com New York will take you inside that system, one the majority of New Yorkers and even the education officials charged with policing it know next to nothing about. As with anything in New York, big here means huge. More children attend Brooklyn’s Jewish parochial schools than attend Catholic schools in Brooklyn and Queens combined, and unlike their Catholic counterparts, yeshivas are growing. Although significant Jewish enclaves exist in all five boroughs, Brooklyn is home to the majority of the city’s 1.1 million Jews, and the vast majority of its most religious ones. In Kings County alone, the Orthodox emphasis on large families has helped spur an education crunch of epic proportions: In just four years, the borough’s Jewish parochial schools have seen an enrollment increase of more than 12,000 pupils, according to state records. Though several yeshiva principals declined to comment on their curriculums for this story, Rabbi Sholom Skaist of Williamsburg’s massive United Talmudical Academy told DNAinfo.com New York the school does teach general subjects — just not very much. Like other children in high-poverty schools both public and private, many of Brooklyn’s Jewish parochial students receive federal, state and city aid, in the form of free- and reduced-lunch programs, educational materials and federal Title I allocations to educate students from poor families. At least a few also receive Title III funds specifically earmarked for English learners, which is hardly surprising in communities like Williamsburg where the lingua franca is Yiddish and even adults often struggle to communicate outside of that language. “I can’t read, I don’t know anything about the outside world — I have to struggle every time I have to read a menu for a restaurant,” said Hershy Gelbstein, 18, who got the majority of his education at United Talmudical Academy. Neither the city DOE nor its counterparts in Albany or Washington could tell DNAinfo which of Brooklyn’s private schools benefited from Title III federal aid for English instruction, although the DOE said the total Title III allocation for private school students in the city is about $10 million. According to a 2009 report by the Board of Jewish Education of Greater New York, almost $1.9 million in Title III money funded English instruction for students at the city’s Jewish parochial schools. Still, Title III is just the tip of the iceberg. The United States Department of Education has repeatedly chastised both the state and the city for failing either to retain adequate control over the much larger and more widespread Title I allocations, about $50 million of which are parceled out to the city’s private schools every year, or to account for how those millions are spent. Year after year of reports from the United States Department of Education’s Student Achievement and School Accountability Programs show federal education officials practically begging the city and state to exercise more control over how private schools in their jurisdiction spend federal money. Equivalency of instruction, too, falls at the city’s feet. Federal and state officials confirmed that the New York City Department of Education is ultimately responsible for ensuring both that the city’s private schools spend government money appropriately and that they provide the minimum standard of instruction mandated by law. “If a child attends a nonpublic school or is being educated at home, the board of education of the school district in which the child resides must be assured that the child is receiving instruction which is substantially equivalent to that provided in the public schools,” said state DOE spokeswoman Antonia Valentine. In Brooklyn, that means the New York City DOE. Marge Feinberg, a spokeswoman for the city DOE, declined to respond to specific questions about the admission by the head of United Talmudical Academy and other allegations of insufficient secular instruction. "We were notified of a situation last year regarding requirements," Feinberg said. "As a result, we engaged in the process outlined by NY State." It was unclear whether the "situation" involved any of the schools DNAinfo.com New York asked about. Libby Pollack, a Williamsburg native who was educated in the Jewish school system, thinks it's impossible that officials don't know what's going on. Pollack isn't alone — the organization YAFFED (Young Advocates for Fair Education), a coalition of former yeshiva students, has spent more than a year trying to sound the alarm to education officials. They say that Jewish parochial schools should be free to teach what they please, so long as they also teach what the state requires. Back at Lamplighters, English, science and math is integrated into religious studies, said Director Yocheved Sidof, whose two oldest children, Uriyah, 7, and Mayan, 4, attend the school. The series on Jewish parochial education in Brooklyn continues this week on DNAinfo.com New York.